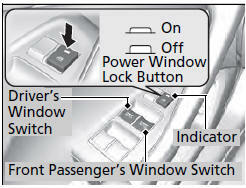 The power windows can be opened and closed when the ignition switch is in ON , using the switches on the doors. The driver’s side switches can be used to open and close all the windows. 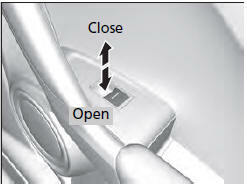 The power window lock button on the driver’s side must be switched off (not pushed in, indicator off) to open and close the windows from anywhere other than the driver’s seat. When the power window lock button is turned on (pushed in, indicator on), you can only operate the driver’s window. Turn the power window lock button on when children are in the vehicle. To open: Push the switch down lightly. To close: Pull the switch up lightly. To open: Push the switch down. To close: Pull the switch up. To open: Press the unlock button twice within 10 seconds and hold it down for the second time. If the windows stop midway, repeat the procedure. To open: Unlock the driver’s door with the key. 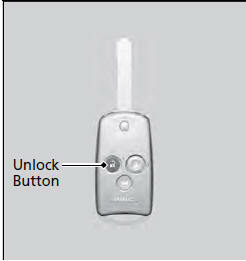 Within 10 seconds of returning the key to the central position, turn the key in the unlock direction and hold it there. To close: Lock the driver’s door with the key. Within 10 seconds of returning the key to the central position, turn the key in the lock direction and hold it there. Release the key to stop the windows/ moonroof at the desired position. If you want further adjustment, repeat the same operation. You can only operate the moonroof when the ignition switch is in ON . Use the switch in the front of the ceiling to open and close the moonroof. To open: Pull the switch back firmly, then release. To close: Push the switch forward firmly, then release. The moonroof will automatically open or close all the way. To stop the moonroof midway, touch the switch briefly. To open: Pull the switch back, and hold it until the desired position is reached. To close: Push the switch forward, and hold it until the desired position is reached. To tilt: Push on the center of the moonroof switch. Opening or closing the moonroof on someone’s hands or fingers can cause serious injury. Make sure all hands and fingers are clear of the moonroof before opening or closing it. Opening the moonroof in below freezing temperature or when it is covered with snow or ice can damage the moonroof panel or motor. The power moonroof can be operated for up to 10 minutes after you turn the ignition switch off. When resistance is detected, the auto reverse function causes the moonroof to change directions, then stop. 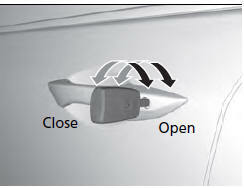 Auto reverse stops sensing when the moonroof is almost closed to ensure that it fully closes. Make sure that all objects, including fingers, are clear of the moonroof.